The Leica MD was a specialized camera developed by Leitz in the 1963 for use with microscopes and other technical equipment. Remember that the other branch of the Leitz empire was microscopes and scientific optics. It could also be used with the Visoflex reflex housing. The MD was a simplified Leica M1, which in turn was a simplified M2. The MD has no viewfinder or rangefinder. While you can use it for its original purpose with a microscope or telescope, the more contemporary use would be with an ultra-wide angle lens such as the new Voigtlander 12mm, 15mm, or 21mm lenses. These lenses don't need to be rangefinder focused. In many ways, the Bessa L is an updated Leica MD with a built-in meter. I swapped my Canon P for this Leica MD at a swap-meet in Saint Paul, Minnesota in April of 2004. The MD is a rather rare camera as only 3000 were made. It was replaced with the MDa in 1967 which was much more common, with 14,500 made. M1 Based on the Leica M2. Viewfinder only, no rangefinder. MD 1963-67 Based on the Leica M1. No viewfinder/rangefinder. MDa 1967-76 Based on the Leica M4. No viewfinder/rangefinder. Rewind crank slanted (like M4). MD-2 1977- Based on the Leica M4-2. No viewfinder/rangefinder. If you hook up a Visoflex reflex housing to the MD, you have a workable SLR camera, although it's a little bit unwieldy. There's a small slit on the bottom plate that allows you to insert a thin transparent plastic information sheet before exposure. If you're photographing slides and want to record what you're documenting, you can write in on the info sheet and insert it. The baseplate can be replaced with a standard M3/M2/M1 baseplate if you're using the camera in the field. 320g Body: 138mm x 77mm x 36mm; 595g. 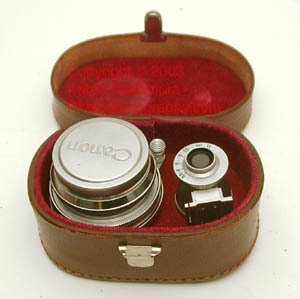 Leica M6 switch, M2/M3 flash plugs, 35 summilux focusing knob, etc.